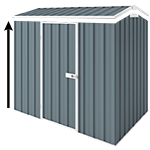 Our Double Garage Sheds are high-quality Australian made buildings, which are manufactured, from Australian made BlueScope Steel. The all-steel structure also means it is strong, versatile, weatherproof and easy to maintain. This Double Garage Shed comes in colour steel and can be used as a workshop, to store small vehicles, boat or as an entertainment area. This garage has N3 non-cyclonic rating to withstand 180km/h winds. Having previously purchased a garden shed from you, and been happy with it, we bought the double garage when my son in Sydney wanted to get his collectable cars away from the sea air. We live in Dubbo, well away from the sea, so he thought we were a handy spot for storage. I did use some improvements of my own, however. I used pop rivets throughout, instead of the self tappers supplied, and as we are in the middle of a mouse plague, I have added reverse angle on the door to cover the gap, and also on the bottom of the doors, to abut the concrete. The shed is not quite finished yet still have guttering & trim o complete. The garage is situated in our horse paddock, but surprisingly does not look out of place, I think because the trees soften the outline. I think it looks really good! But I may be biased, having built it myself, with the help of my wife, who is now a certified pop riveter!! Has been a dream to erect as the plans etc have been simple & easy to follow. Highly recommended shed..
Love the product and the service I received from you guys as well as the promised bonus you sent me. Was really easy to put up and everything was supplied.